Yokohama Triennale 2017’s theme and main keywords are connectivity, isolation, co-existence, and diversity. We refer to facilities implementing projects and exhibitions linked to these keywords, and places and buildings with historical backgrounds as “Yokohama Sites,” which are introduced here. Meanwhile, the artist Tamura Yuichiro combines several sites like stars and creates Constellation γ(Gamma), a narrative with a unique viewpoint. 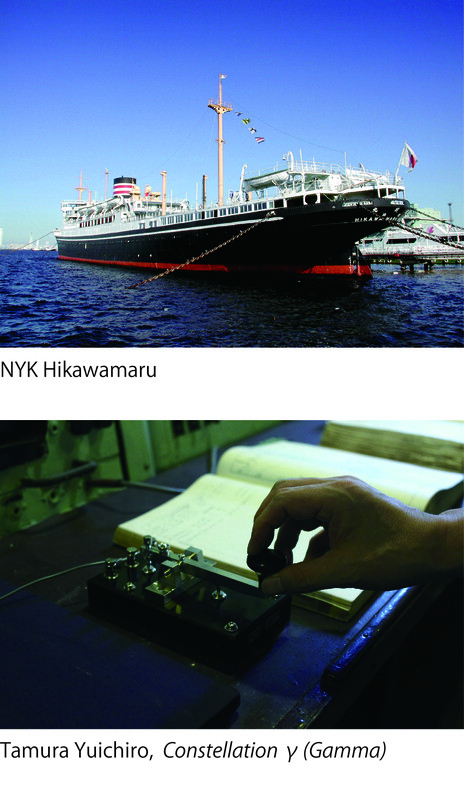 Visitors can view the story Tamura has woven in the former third-class dining hall of the ship NYK Hikawamaru moored in Yamashita Park. At one time the Yokohama Red Brick Warehouse, built as a government-bonded storage facility during the Meiji Era (1868- 1912), was crucial to Yokohama’s economic life as a port city. The advent of standardized shipping containers rendered it obsolete. vessels, was replaced by satellite communications. Yokohama is home to historic sites that have outlived the roles they played “at one time.” Now, let us lend an ear to what these sites can tell us. Together, they form a constellation. We call it γ (Gamma).